"Poppa Raffensberger told his wife time and time again that their first-born must be a lefthanded pitcher," sportswriter Joe King reported. "Kinfolk among the God-fearing Pennsylvania Dutch warned him that such anticipation was sinful." Poppa Clarence got his wish when his wife, the former Katie Cunningham, gave birth to Kenneth David Raffensberger on August 8, 1917, in York, Pennsylvania. The boy was lefthanded; his father helped him become a pitcher. "He would take me down an alley in back of our house about three times a week and work with me sometimes for hours," Ken said. "I wanted to throw always as hard as I could, but the main thing he wanted was for me to hit the target, his glove." Ken Raffensberger was a good pitcher stuck with bad teams - one of the "unluckiest" pitchers in history, according to analyst Bill James. Except for his one-game rookie season, he never played for a winning club during a 15-year major league career, but his earned run average was usually better than average and he was a premier control pitcher. Ken attended William Penn High School. The school had no baseball team, so he played for a youth team organized by a local doctor, Roman Wise, and later for the York Post 127 American Legion team. He dropped out of school after his junior year and joined his father selling condiments and spices until he found a job as an apprentice in a boiler works for 17 cents an hour. Soon he was earning $20 a game pitching once a week for a semi-pro team. He had to take a pay cut when Cardinals scout Pop Kelchner signed him to a professional contract. He made $75 a month as a rookie with Cambridge, Maryland, in the Class D Eastern Shore League in 1937. Raffensberger posted an 18-6 record in Cambridge, and in 1938 the Cardinals promoted him to their top-level farm team at Rochester, New York, in the International League. This was unusually rapid progress; St. Louis had the majors' largest farm system and required most prospects to serve a long apprenticeship. On June 13, 1938, he married a local girl from York, Pauline Bausman. After he won 15 games for Rochester, the Cardinals invited him to spring training in 1939. Although he was only 21, sportswriter Red Byrd commented, "Raffensberger looks like a natural... He is a smooth workman, calm and with amazing poise." On April 25 he pitched a scoreless inning in relief against Cincinnati in his big-league debut, but was soon sent back to Rochester. He won 15 again, also losing 15. A sportswriter praised his "sneaky fastball" and commented, "For a youngster he has shown much poise, and was considered a smart pitcher in the International, with a lot of confidence in himself." In December the Cardinals traded him to the Chicago Cubs for two minor league players and cash. He pitched in 43 games for the Cubs in 1940, mostly in relief, posting a 7-9 record. His 3.37 ERA was half a run below the league average. Chicago writer Ed Burns predicted, "Ken Raffensberger should become a great pitcher." The Cubs evidently did not agree. He pitched just 10 times in 1941 before he was sent down to Los Angeles of the Pacific Coast League. Raffensberger credited Cubs manager Gabby Hartnett, a Hall of Fame catcher, as an important teacher, but a sportswriter reported that the club had given up on him. After his taste of the big leagues, his three seasons in Los Angeles "were tough years," he recalled later. He won 19 games for the Angels' pennant-winning team in 1943 and earned a ticket back to the majors. But just barely: He joined the Philadelphia Phillies, longtime doormats of the National League. Philadelphia had finished last every year from 1938-1942 and rose to next-to-last in 1943. They were so bad they briefly changed their nickname to "Blue Jays," the equivalent of wearing bags over their heads. In 1944 they would settle on the bottom again, losing 92 games. Raffensberger quickly emerged as one of Philadelphia's top pitchers. In July his record was 8-10, and he was chosen for the All-Star team. At the showcase in Pittsburgh, he pitched scoreless ball through the fourth and fifth innings and was credited with the win. But by the season's end, he had won 13 games and lost 20. His first season as a starter set the pattern for his career. His 3.06 ERA was 18 percent better than the league average, adjusted for his home field, Shibe Park. He was the NL's best control pitcher, walking only 1.57 batters per nine innings; he would finish in the top five in that category five times in nine full years as a starter. Raffensberger was inducted into the Navy in May 1945, but served only five months. In 1946 he picked up where he had left off: excellent control, decent ERA, and a losing record, 8-15. He led the league with six saves, a statistic that was not computed until years later. When he started poorly in 1947, Philadelphia swapped him and catcher Hugh Poland to Cincinnati for backup catcher Al Lakeman on June 14. For years afterward, Phillies owner Robert Carpenter would call that "our worst trade." Lakeman hit .162 for Philadelphia; Raffensberger became a mainstay of the Cincinnati pitching staff for the next seven years. The Reds featured two sometimes unhittable, sometimes unpredictable fireballers, Johnny Vander Meer and Ewell Blackwell. Raffensberger was a different breed of pitcher. Besides his splendid control, he was known for his calm demeanor, his quick work and his smorgasbord of off-speed pitches that frustrated hitters. In a 1949 profile in The Sporting News, he claimed he threw only a fastball, curve and forkball. Dodgers coach Jake Pitler disagreed: "He's got a million types of pitches and good control...He hasn't got a fastball." Other observers noted that he multiplied his pitches by throwing from different arm angles - overhand, three-quarters, sidearm and occasionally underhand. Raffensberger took exception when sportswriters jibed that he didn't break a sweat on the mound. "I do sweat," he insisted. Jackie Robinson: "He is one of the smartest pitchers. He gives you that tantalizing stuff that looks good but isn't." Marty Marion: "You feel that you want to hit at that nice, easy motion, but he always has a little more than you think." Enos Slaughter: "You swing at something which isn't exactly where you think it is." Stan Musial, the National League's best hitter, later named "crafty Raffy" as the toughest pitcher he faced. In his 1964 autobiography, Musial (or his ghostwriter, Bob Broeg) wrote, "The fork ball looked as big as a grapefruit, but fell off the table, low." "To listen to the hitters, I don't have anything," Raffensberger said. "I take a lot of kidding that I don't have a fast ball and don't have a curve ball. All I got, I guess, is confidence in myself to get that ball over." Cincinnati finished fifth in the eight-team league in 1947, but for the rest of Raffensberger's career the Reds were either sixth or seventh. They never won more than 69 games. 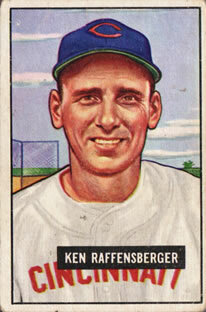 Raffensberger posted winning records only twice: 18-17 in 1949 and 17-13 with a 2.81 ERA in 1952. Both times he led the league in shutouts. He pitched four one-hit shutouts during his career. On May 31, 1948, he carried a no-hitter against the Cardinals into the eighth inning before Nippy Jones singled. He beat the Cardinals again on one hit six weeks later. On May 22, 1949, Brooklyn's Gil Hodges broke up his no-hitter in the eighth. Raffensberger set down the Dodgers on 83 pitches. "The one against Brooklyn I think was the greatest," he later told the York Daily Record. The Dodgers' predominantly righthanded lineup was notoriously tough on lefthanded pitchers; Raffensberger's managers sometimes held him out when the teams met. At Chicago's Wrigley Field on September 2, 1951, Eddie Miksis beat out a dribbler down the third-base line in the third inning for the Cubs' only hit. One account said the ball might have rolled foul if third baseman Bobby Adams had not picked it up. Raffensberger walked none, one man reached on an error, and he threw only 69 pitches. In 1953 Cincinnati finished sixth for the fourth straight year. The 36-year-old Raffensberger registered the worst won-lost record of his career, 7-14, although his 3.93 ERA was better than average. New manager Birdie Tebbetts touted him as one of the team's top pitchers for 1954. But he sprained his right ankle when he stepped on a ball during spring training drills and was seldom used in the early weeks of the season. The Reds released him in June and assigned him to Havana of the International League. Before he left Cincinnati, he called several other clubs, but found no job openings. He said, "I'll be back in the majors before this season ends because I know I can still pitch winning baseball if I get to work regularly." Raffensberger won 119 games and lost 154; his .436 winning percentage was slightly better than the other pitchers on his teams. His 3.60 ERA was 10 percent better than the league average, adjusted for his home parks. In The Neyer/James Guide to Pitchers, Bill James named him one of the 10 "unluckiest" pitchers of all time; with his ERA, he "deserved" a record of 146-127. He gave up more than one hit per inning, but held opposing batters to a .303 on-base percentage because he seldom walked anyone. Only a few more than 100 pitchers in baseball history have recorded an opponents' on-base percentage below .300. He pitched 31 shutouts; when he left the majors, only Warren Spahn had more among active pitchers. He also lost 23 games when his teams were shut out. Finishing the 1954 season in Cuba, he won five games in a row during one stretch. Then he returned home to pitch for the York White Roses, a Class B Baltimore farm club in the Piedmont League. In 1956 he served as player-manager at Lafayette, Louisiana, in the Class C Evangeline League, and pitched a shutout a month before his 39th birthday. The next season he managed the Cubs' farm team at Burlington, Iowa, in the Class B Three-I League. That ended his baseball career. Raffensberger spent the rest of his life in York, where he and Pauline lived with their sons Jack, James, Michael and Steven and their daughter Nancy. He worked as a bartender and was an avid fisherman. His granddaughter, Melissa Raffensberger, described him as "an awesome fellow...kindhearted." In a 1986 interview with his hometown newspaper, he said: "I can't complain. Baseball's been good to me. At my peak I was making top scale wages at the time, was included when the players' pension fund was created, and have been receiving checks regularly since I was 50, with increases every year. And besides, whatever I was paid was much more than I could have earned in any York industry as a high school dropout." He said his highest salary was $16,000. At an old-timers event in 1995, he weighed in on modern baseball: "I really wouldn't want you to print what I think of what has happened to baseball.... I tell you that we had loyalty, comradeship and everyone got along pretty well... Today a player is with a team for the money and may be gone tomorrow." Ken Raffensberger was 85 when he died on November 10, 2002, at York Memorial Hospital. The cause of death was not reported. His daughter, Nancy Rhoads, had died a week earlier. Raffensberger is buried in Mount Rose Cemetery in York. Most information about Raffensberger's life and career comes from The Sporting News. Profiles of the pitcher appeared on August 24, 1949, and May 23, 1951. Statistics come from The Sporting News, the Sabermetric Baseball Encyclopedia, Barnes & Noble's Baseball Encyclopedia (2004), Total Baseball (Fifth Edition), and Retrosheet. Melissa Raffensberger shared reminiscences about her grandfather in a telephone interview on June 26, 2004. The York (Pennsylvania) Daily Record reviewed his life on November 11-12, 2002. Thanks to sports editor Chris Otto for providing clippings. Bill James and Rob Neyer, The Neyer/James Guide to Pitchers (Fireside Books, 2004). William Marshall, Baseball's Pivotal Era: 1945-1951 (The University Press of Kentucky, 1999).